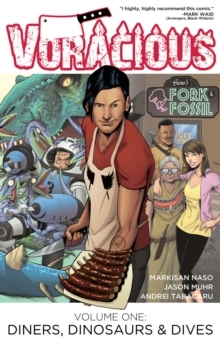 Hunting dinosaurs and secretly serving them at his restaurant, Fork & Fossil, has helped Chef Nate Willner become a big success. 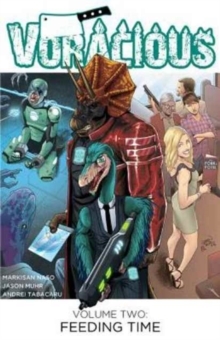 But just when he's starting to make something of his life, he discovers that his hunting trips with Captain Jim are actually taking place in an alternate reality - an Earth where dinosaurs evolve into Saurians, a technologically advanced race that rules the far future! Some of these Saurians have mysteriously started vanishing from Cretaceous City and the local authorities are hell-bent on finding who's responsible. Nate's world is about to collide with something much, much bigger than any dinosaur he's ever roasted. Collecting VORACIOUS: Feeding Time #1-5, this second volume of the critically acclaimed series serves up a colorful bowl of characters and a platter full of sci-fi adventure, mystery and heart!